Retro inspirations and re-editions based on vintage timepieces have been all the rage in new watch introductions this year as the craze for a bygone era of watchmaking continues to heat up in the secondary market. Case in point: Carl F. Bucherer’s Bicompax Annual Calendar is inspired by a 1956 model from its archives, updated with a larger case size—41 mm compared to 34 mm, which is miniscule by today’s standards—and a function that wasn’t invented until 1996. The annual calendar, the younger, less complex version of the perpetual calendar, is a hot function right now, as are vintage-style watches, but this model stands out as one of the most well-proportioned remakes from its era. The panda-style dial version gives it a sporty vibe, and the two-tone version resembles a classic gold gentleman’s watch from the 1950s. The larger case size allows for the watch’s outstanding feature: the double-digit date window at 12 o’clock. The date on an annual or perpetual calendar is usually read on a circular subdial index or squeezed into a small window at 4 o’clock on a classic dress watch. In this piece, the space between 4 o’clock and 5 o’clock is reserved for the month display, and the date is writ large at 12 o’clock. For some purists, date windows are a detraction to design no matter what, but for others it is one of the more essential every day functions in a timepiece. Here its big date feels well-placed given that most people tend to reference the date more than the month. Keeping the month window small detracts little from its functionality, and leaves the dial fairly uncluttered, an important consideration in a watch so complicated. The subdials are used for a small seconds index and the 30-minute counter for the chronograph function, which is an added bonus. Few brands make a combined chronograph annual calendar, particularly at this price point. Patek Philippe’s steel Ref. 5960-01G is, not surprisingly, considerably more at around £50,500 in white gold, while Richard Mille’s RM 60-01 Regatta Flyback Annual Calendar Chronograph is more than double the price in titanium at 123,500. Ulysse Nardin’s Marine Annual Calendar Chronograph (around £11,100) and Montblanc’s Heritage Chronométrie Chronograph Annual Calendar (around £7,280) also combine the two functions in steel models, but neither delivers the chronograph-annual calendar package for the price Bucherer is offering: around £5,520. The two-tone model is a smidge more, at £8,440. The Annual Calendar complication displays day, date or often, just date, which is the key function, as well as month. It needs only one adjustment per year, at the end of February. Patek Philippe was the first to create one, the Ref. 5035, in 1996. Carl F. Bucherer Heritage Bicompax Annual Calendar Courtesy of Carl F. Bucherer There are two variations of the Bicompax Annual Calendar. The stainless steel model has a panda-style dial in silver and black with a black rubber tropic-style strap with a diamond-shaped pattern. The two-tone model is stainless steel with 18-karat rose gold bezel, push buttons and crown. The two-tone model most closely resembles the original 1956 model, which was solid gold with a rosy salmon coloured dial. The elongated push buttons and their spacing from the crown are very close to the original, as is the Arabic font. The original’s telemeter scale (which measures the distance between the user and an event that can be heard, previously used by the military to measure the distance of a bomb or a storm) is replaced by a tachymeter scale (which measures traveling speed over a fixed distance). The syringe-style hands are the same as those on the 1956 model. Carl F. Bucherer’s Heritage collection, which launched in New York last Autumn, consists of limited editions with complications, inspired by the brand’s archives. Each of the two models of the Heritage Bicompax Annual will be produced in a series of 888 pieces, a reference to CFB’s founding date of 1888, in Lucerne, Switzerland. 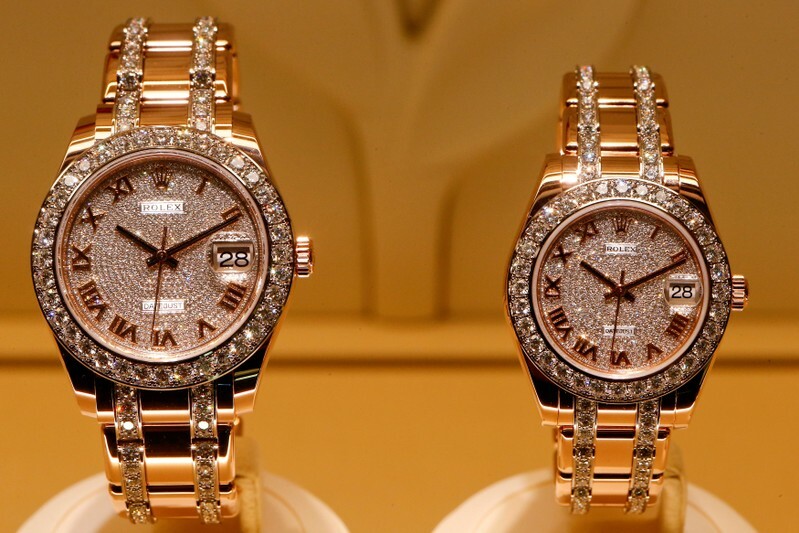 BASEL, Switzerland (Reuters) – Watches of Switzerland expects to make further acquisitions in the United States, which it first entered in 2017 with the purchase of jeweler Mayors, its chief executive told Reuters. Owned by U.S.-based private equity firm Apollo Global Management, Watches of Switzerland has since opened several stores, including in Las Vegas and New York. “Could we add other businesses? Very easily,” Brian Duffy said in an interview at this week’s Baselworld watch fair. The Watches of Switzerland Group, which sells brands such as Rolex, Richemont’s Cartier and Swatch Group’s Omega and has more than 130 showrooms, is the biggest watch retailer in Britain and a candidate for a stock market listing. “If it’s a quality business, the right location of stores and support from the brands, it would be obvious that we’d be open to it. Probably over the couple of years ahead, we’ll do some deals in the area,” Duffy said of his U.S. plans. Watches of Switzerland, which spans its eponymous stores as well as Mappin & Webb, Goldsmiths, Mayors, Watchshop and Watch Lab competes with rivals such as Lucerne-based Bucherer, which last year bought U.S. jeweler Tourneau. Last year the company, which has been under Apollo’s control for more than six years, flagged that its owners were working with advisers on strategic options, including a potential initial public offering (IPO). “It would be good for our group with its size and scale to have public ownership, reduced leverage and great governance and accountability, sources of capital if that’s ever necessary,” he said, without giving further detail. The group’s revenue grew 21 percent to 685 million pounds ($902 million) in 2017/2018, and its operating profit rose by more than a third to 37 million pounds, about twice the levels when Apollo bought it in 2013.